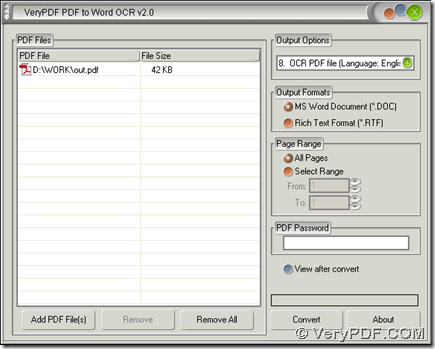 It is easy to recognize English text in scanned PDF file with PDF to Word OCR Converter in Windows systems. You can know more details through the following paragraphs. First, please double click installer of PDF to Word OCR Converter after you download it, then follow setup wizard step by step till PDF to Word OCR Converter is installed on your computer successfully. 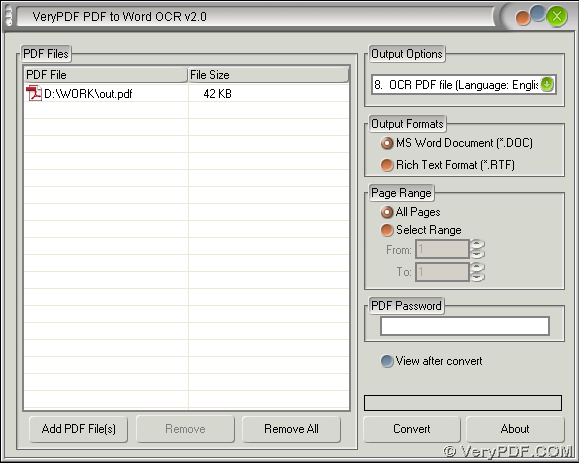 Second, please start PDF to Word OCR Converter on your computer, then on its interface you need to click “Add PDF Files”, then in pop dialog box, please click PDF file and click “Open” there so that PDF file can be added for this conversion and its path can appear in processing form. By the way, if you want to remove this PDF file and change it to another one, please click button of “Remove All” and repeat steps above. Third, if language of scanned PDF file is English and you want to edit this English text later, you need to click “8 OCR PDF file (Language: English)” on dropdown list of “Output Options” so that PDF to Word OCR Converter can help you recognize English text in scanned PDF file with OCR technology later in order to make scanned PDF file editable and converted to Word file accurately without any error. Fourth, after you finish the basic work like above, you need to click one of radios of “MS Word Document” and “Rich Text Format” so that format of Word file can be DOC or RTF later. At last, to select a targeting folder for saving Word file, and start conversion from scanned PDF to Word, please click “Convert” button, then in pop dialog box, you need to select a folder and click “Save” there. A few seconds later, the conversion to recognize English text in scanned PDF file is finished successfully and you can find your Word file added in targeting folder automatically. By now, you have already known the method to covnert scanned PDF to Word based on a way to recognize English text in scanned PDF file with PDF to Word OCR Converter. So for any questions on this process, you can leave your comment here. For any questions on PDF to Word OCR Converter, you can log on its official website. How to convert selected pages of scanned PDF to Word? How to convert scanned PDF to Word in batches? Do you know how to recognize German text in scanned PDF? How to convert scanned PDF to Word? Is your PDF to Word conversion program work on Linux? How to use your pdf to word software? This entry was posted in PDF to Word Converter and tagged scanned PDF to Word. Bookmark the permalink.